OK, I'm wondering if maybe that whole thing about president Trump being a real estate developer was #fakenews? I mean, are we sure he wasn't one of those people who randomly launched tee shirts into concert crowds? I was pretty sure that the remarks at the Celebrate Me rally he held for the press was bad enough (you can read some of those comments in Tuesday's OrangeVerse post -- but I had to cut out a ton of it to stay sane; his full comments are here). But then, he tossed a Bounty of Viva to Hurricane Maria survivors?? 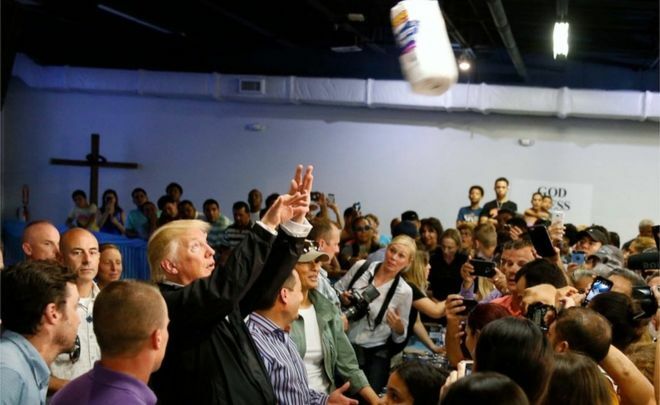 This terrible and abominable view of him throwing paper towels and throwing provisions at people, it really - it does not embody the spirit of the American nation, you know? Does this mean that most of the media showed great warmth and friendship? Most of the Puerto Ricans? Most of the people who caught the paper towels? Most of the people who were paid to show up and say nice things about Trump? I wonder, I really do. Separately, we continue to get round the clock updates from various news outlets about the terrorist attack in Las Vegas. And, of course, we know it's "too soon" to talk about having conversations about maybe doing something about why so many people die or are injured from some kind of shooting each year in the US. We may talk soonly or laterly about making guns easier to silence to protect the ears of the people who use them, but maybe we won't even get to that until after we get a massive tax cut for the rich and corporations. And by rich and corporations, I mean the middle class. Speaking of protecting people's ears, I wonder how it was that swimmers figured out they could use earplugs to keep the water out of their ears? And how was it that someone designed earplugs for shooting? And speaking of massive tax cuts for the middle class, I don't know about you, but as sure as I'm sitting here, I'm really looking forward to filing my taxes on a postcard. I'm not even remotely wondering about the lack of security there -- I'm just happy that the government is looking to shore up the Post Office after all this time.